Emily and I swing into the parking lot, naturally finding a spot on the top floor of the Hyatt Airport parking garage. We’d already unloaded luggage, boxes of games for the flea market, and a massive suitcase full of games for playing. 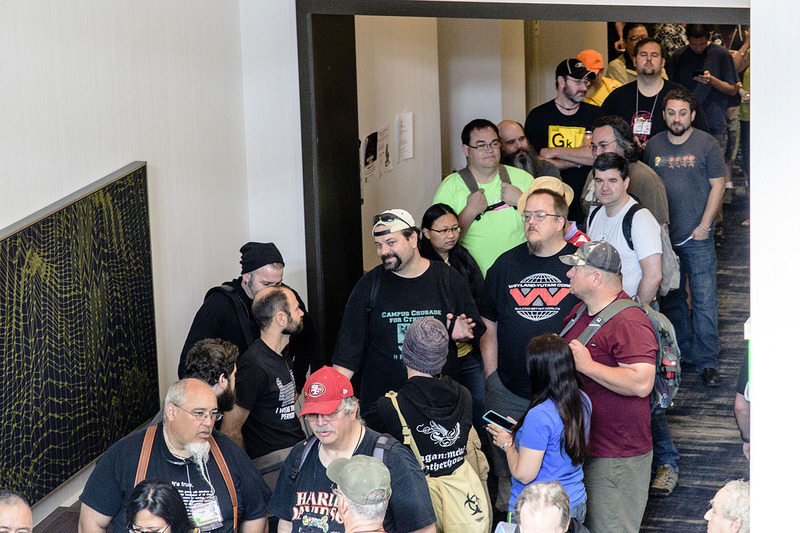 We headed into the con area, making our way towards the registration desk. We headed down the escalator to pick up our badges and wristbands. The registration desk seemed quite on early Friday afternoon. 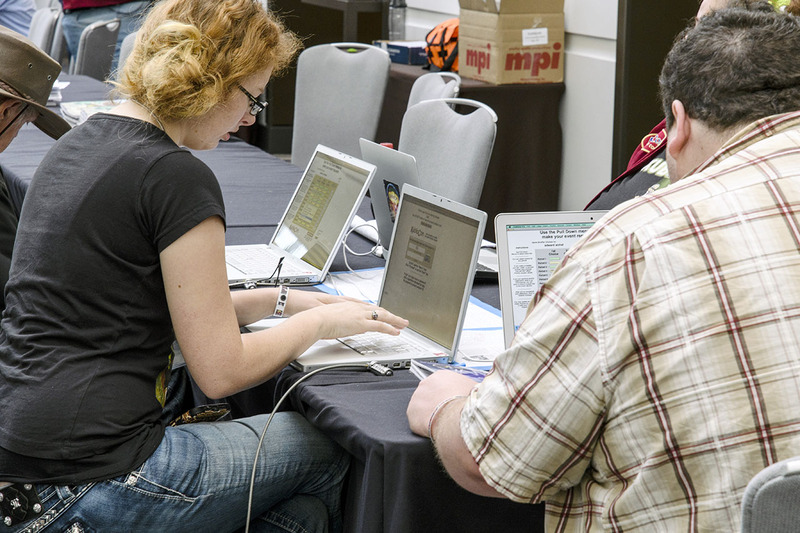 The folks staffing the reg desk worked diligently, digging through dozens of badges, patiently explaining the details of the errata. An unusually massive errata section accompanied the program guide due to rooms shifted because of ongoing remodeling at the hotel. 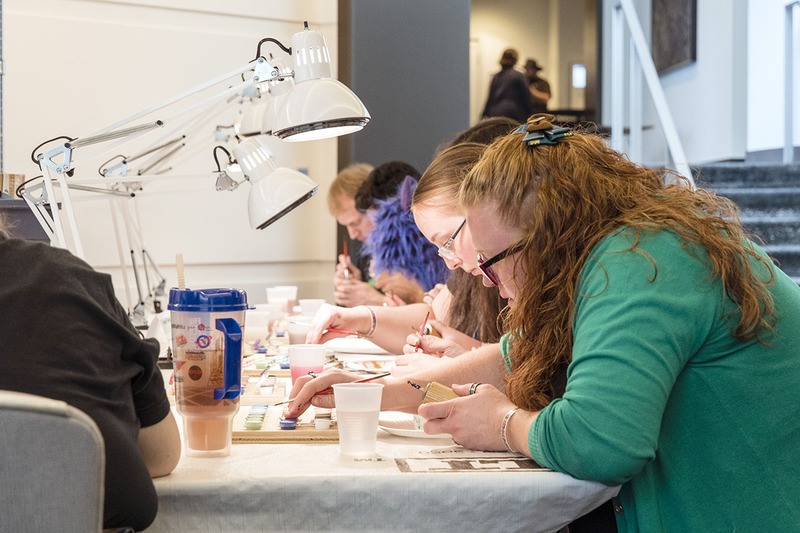 Despite the relatively early hour, a number of people flocked to the miniature painting area, eager to paint up their new minis in time for the weekend gaming ahead. 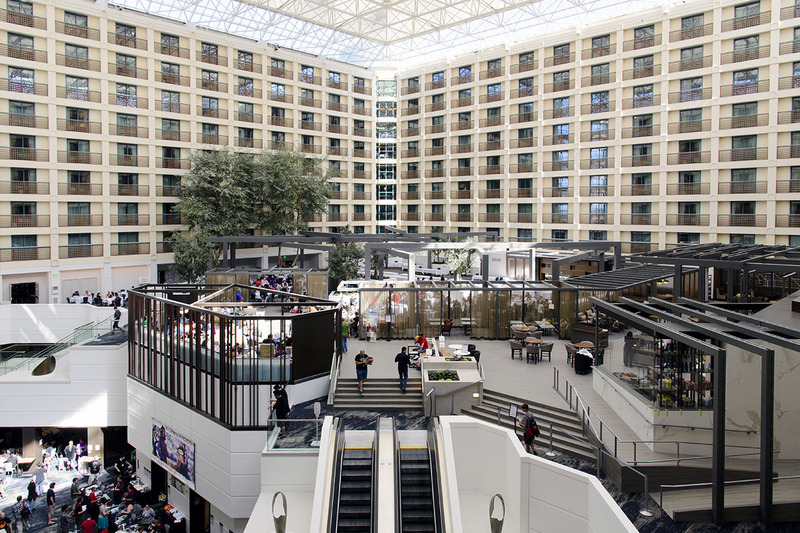 Emily and I wandered through the organized roleplaying areas, where the Pathfinder Society and D&D Adventurer’s League shared a large space in an uneasy truce. Emily decided on the spot that she wanted to give D&D 5th Edition a whirl. D&D ended up consuming her entire weekend. We connected with two of my friends, Ron and Rudy, and grabbed an early dinner before Emily left for her weekend-long D&D marathon. As the three of us wandered the gaming areas and the dealer room, the new board game hotness for the weekend seemed clear. Everyone played this over the weekend. Or so it seemed. Yes, Star Wars fever had come to Kublacon. 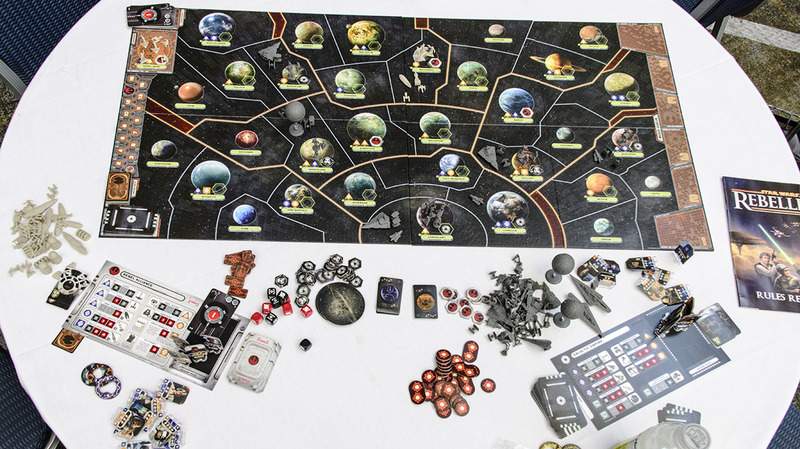 In particular, Fantasy Flight’s new Rebellion title, which pretty much encompassed the entire first trilogy into a massive strategy game, seemed to be everywhere. 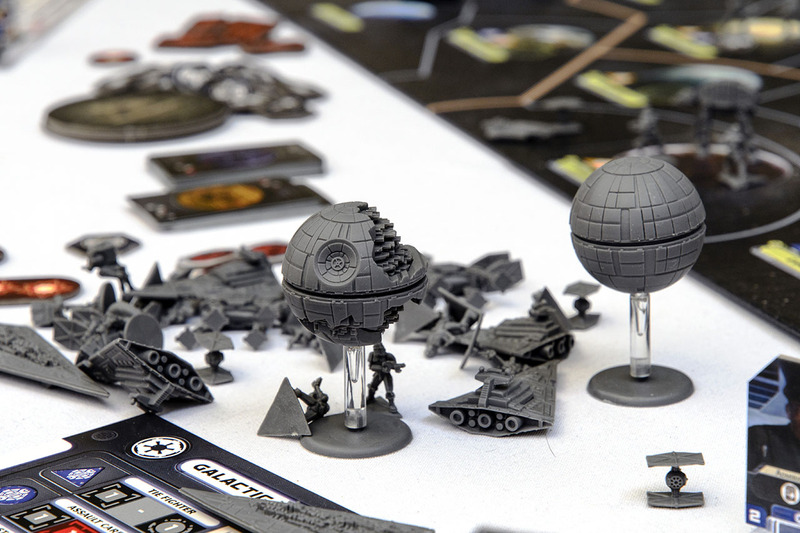 Playing the Imperials meant you could have two Death Stars and a host of other units hunting down the rebel scum. The Rebels, meanwhile, engage in hit and run tactics, trying to delay the Empire’s relentless hunt for the Rebel’s secret base. Essentially, the Empire must find the Rebel base to win, but the Rebels can win running out the clock. And every reputation point earned by the Rebellion shortens the game. The level of detail in the miniatures is amazing. So I picked up a copy, of course. Over the three days, I would end up playing Rebellion three times — not bad for a 3-4 hour game. Star Wars seemed everywhere. 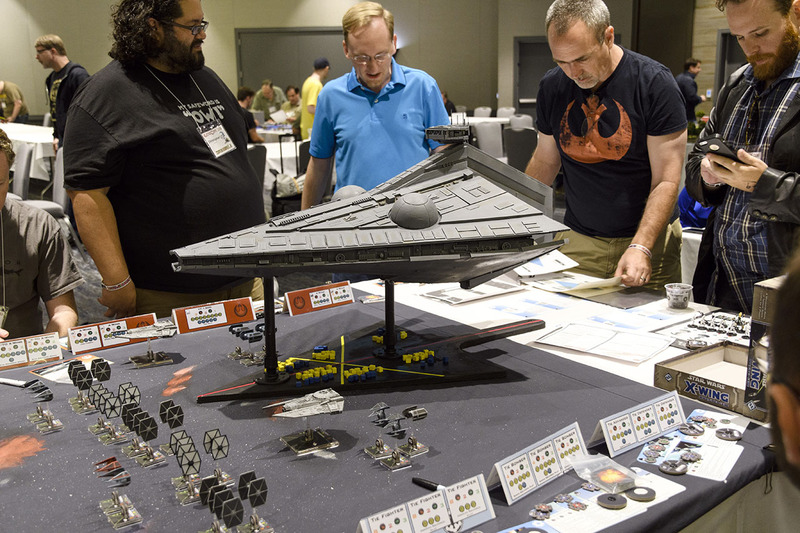 X-Wing Miniatures, another Fantasy Flight game, could be seen, including this massive, homebrew “miniature” star destroyer at one table. 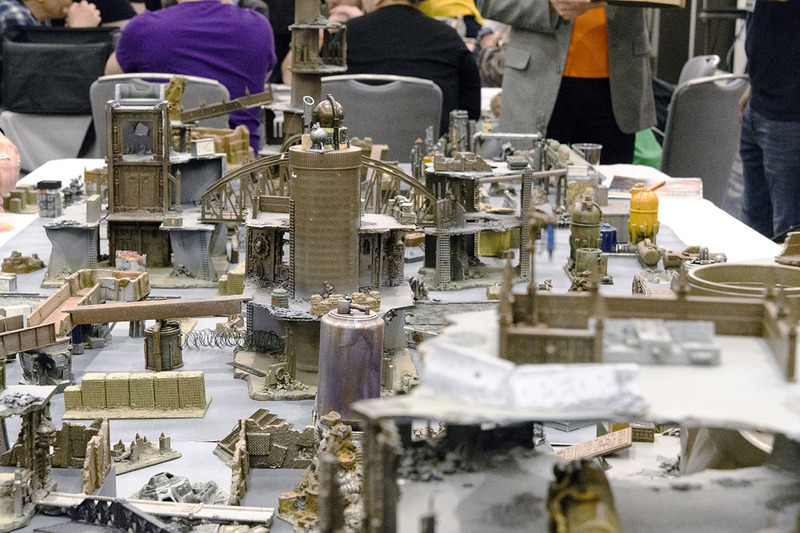 While we’re talking about miniatures, the miniatures gamers seemed to up their game at this year’s con. 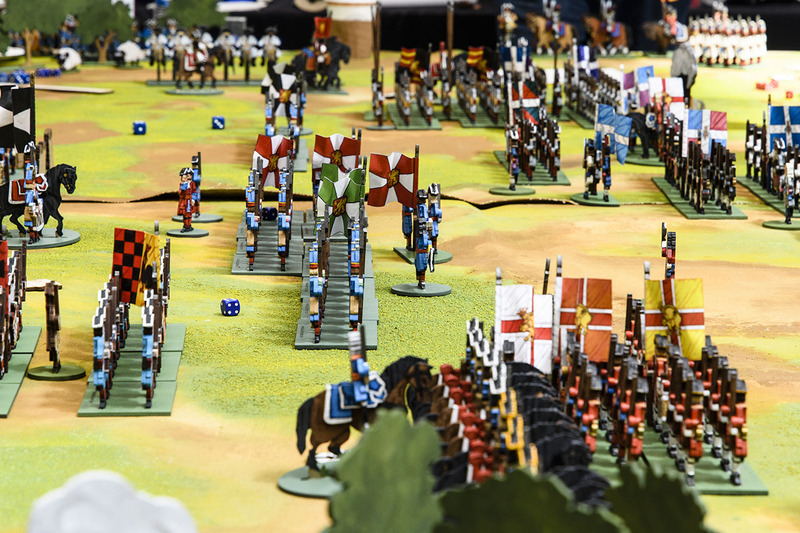 While Warhammer 40K no longer rules the tables, lots of historical and other miniature games took the place of Games Workshop late, lamented 40K. That last one looked interesting. 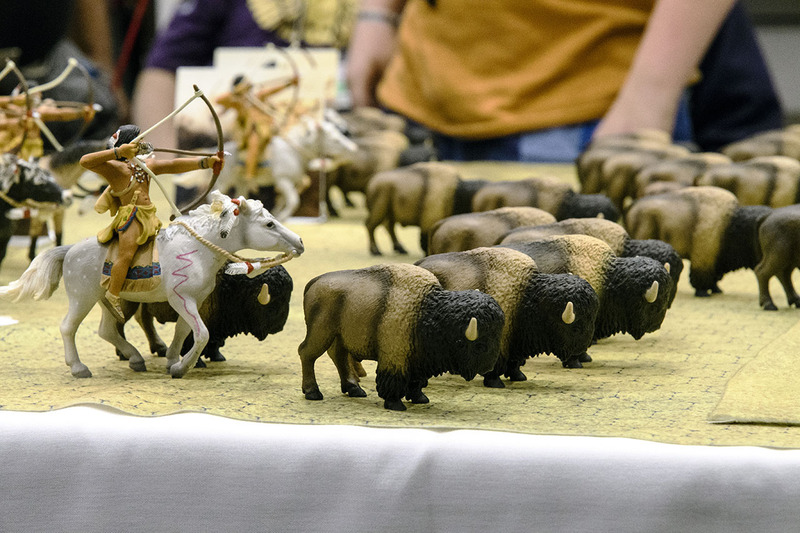 The game seemed to feature Native Americans hunting or herding bison, and the game was being run by a Native American couple. 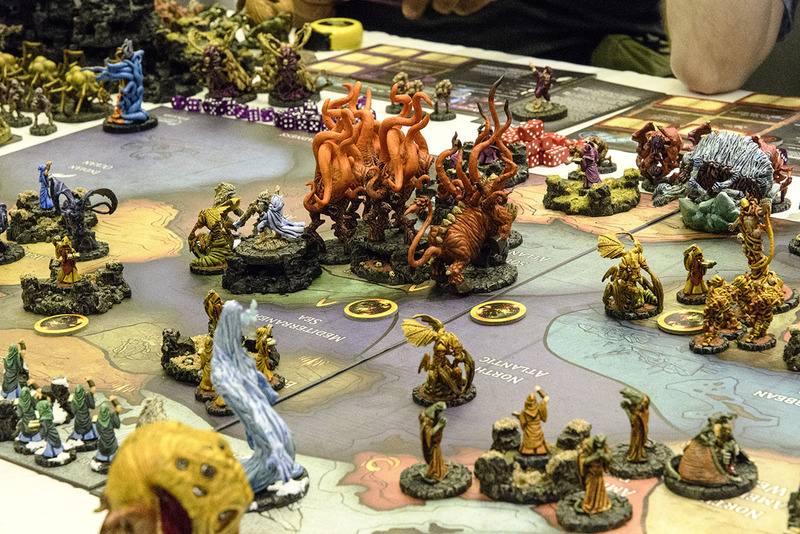 Another intriguing looking miniatures game included oddly two-dimensional miniatures, making the armies look like something out of a Lewis Carroll story. Also, you can never start them too early. 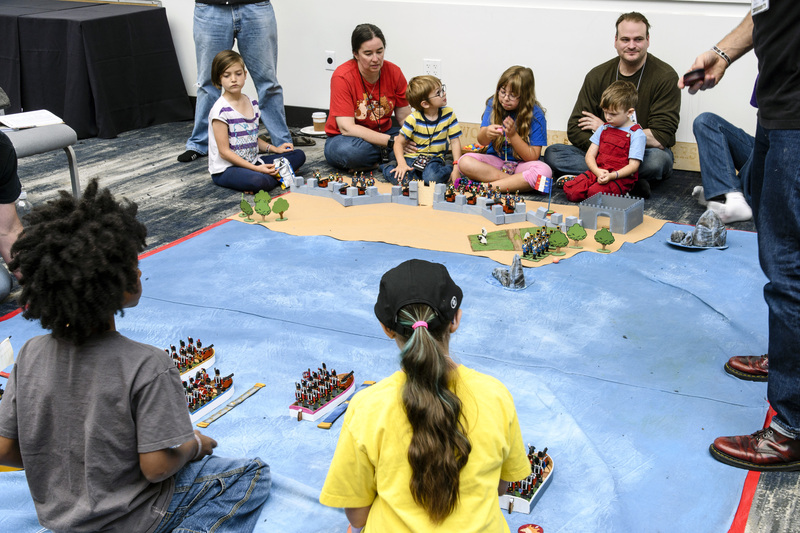 Take a look at these miniature people getting into the miniature gaming action. 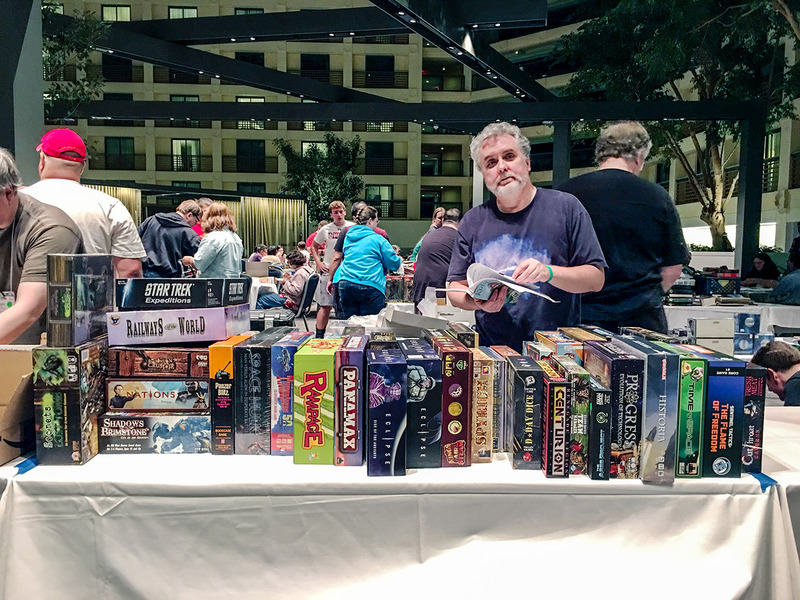 Kublacon’s board game library has expanded considerably over the years, though many of the games see little use, while hotter games are frequently out. 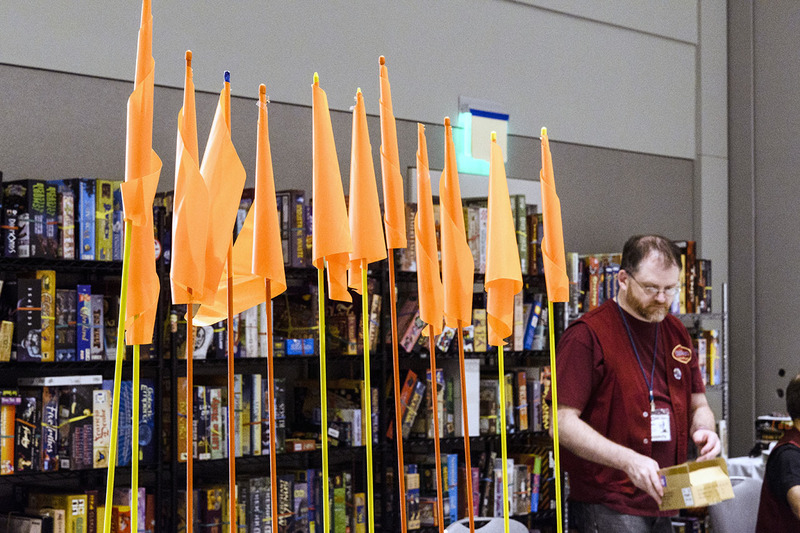 Kublacon uses a flag system, where you borrow a game, and take a flag to your table to indicate you’re looking for players. 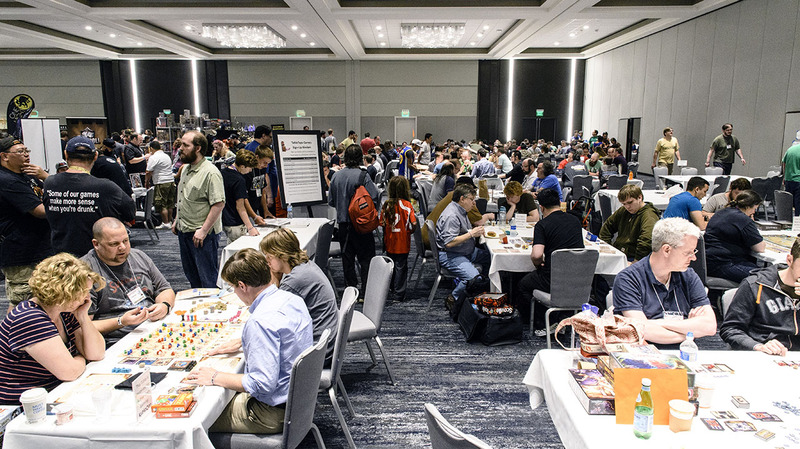 However, the relatively small library didn’t slow down the board gamers, who flocked to the open gaming areas with their own games, playing with friends or anyone else who might ask to join. Every Kublacon includes certain rituals, some which have been with the con from the beginning, like men wearing kilts. Others have emerged in the past few years, like the Cataan tournament. 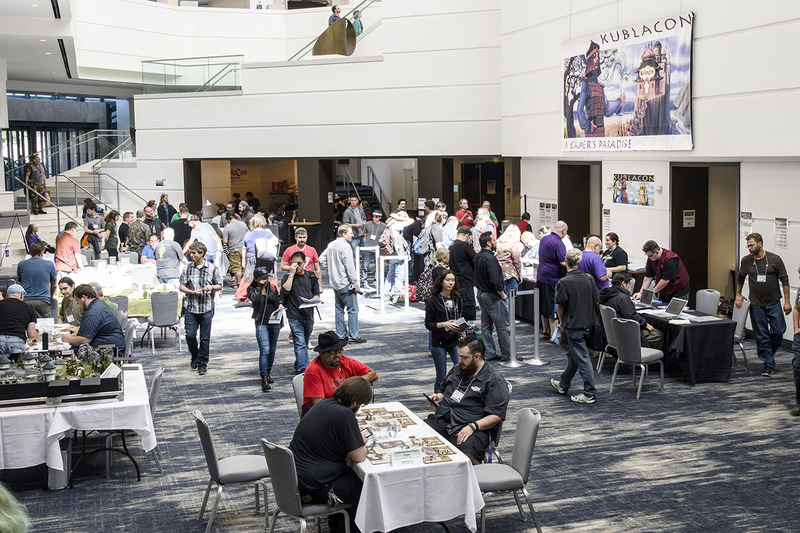 If roleplaying games float your boat, one Kublacon ritual is the Shuffler. 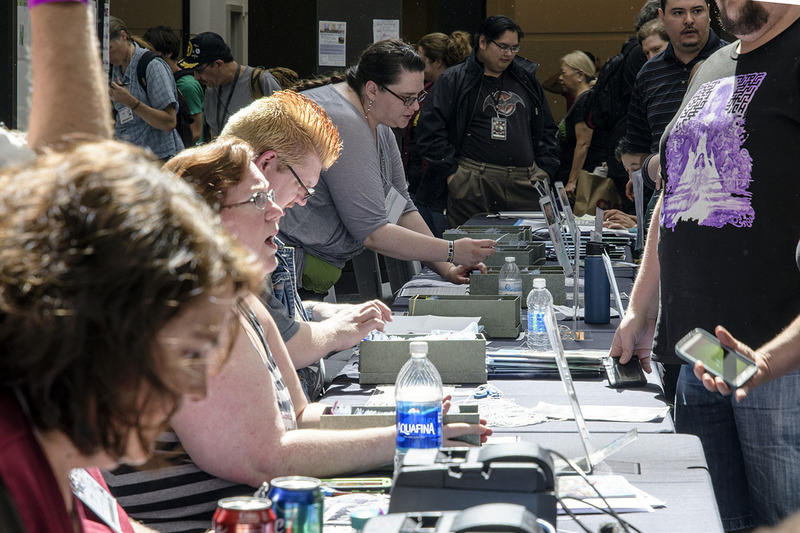 You enter your con id number and the games you want to play into the Shuffler. 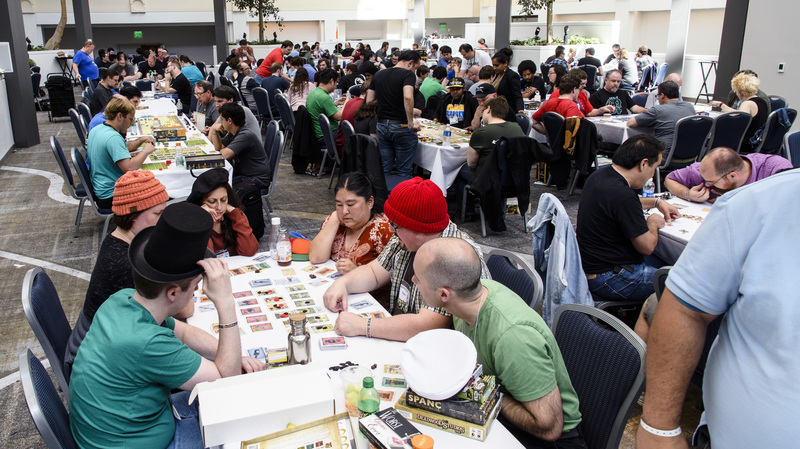 As game time approaches, the Shuffler randomly selects players, since more players want games than gamemasters to run the games. Someone always gets left out, so you always enter backup games. If you don’t get picked, your priority for the next session goes up. Another rite of passage is the Kublacon Flea Market. I often take some games to sell. It’s been interesting seeing the evolution of what sells; I can never predict prices or what moves, but it is a flea market, so the savvy sellers and buyers often engage in the negotiation dance. Gamers waiting to get into the flea market. The line often starts to form two hours prior to the doors opening. This year, my gaming buddy Ron helped me set up. New game demos constitute another rite of passage. Both game resellers and game companies run demo games. 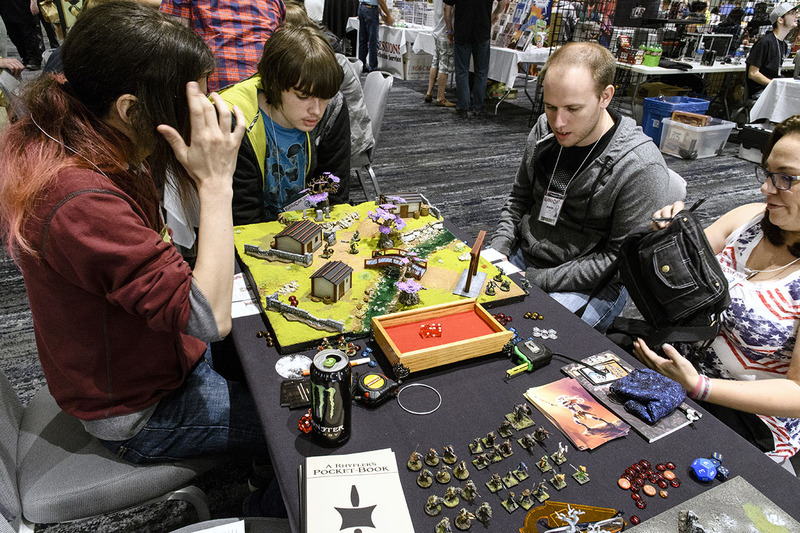 Many publishers give games and swag to enthusiastic fans, who will run demos at cons just for fun (and the games, of course). It’s a good way to learn new games. Colony, Ted Alspach’s next game for Bezier. 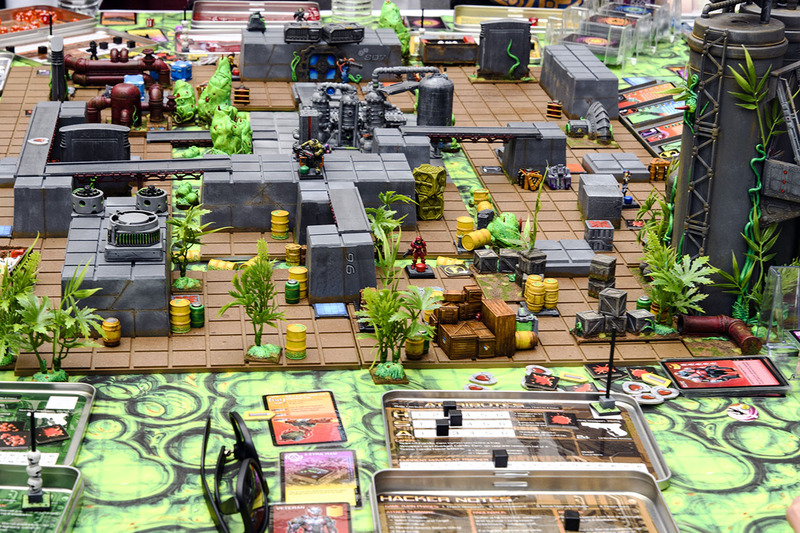 Colony looks to be an interesting blend of dice placement plus deck building. The Big Book of Madness. Think of this as Hogwarts Students meet the Sorcerer’s Apprentice. Students at a school of magic unwittingly unleash a horrific book of curses. It’s up the the plucky first-years to put the genie back in the bottle. Super co-op fun. CV. Remember Milton Bradley’s The Game of Life? More an activity than a real game, The Game of Life was actually pretty terrible. Take that concept — navigating through the pitfalls and joys of modern life — and turn it into set collection / deck building game where you actually need to make interesting decisions. It’s actually pretty good, light fun. The King’s Abbey. This game typifies what’s right and wrong with modern Eurogames. The theme — building and managing a middle-age abbey — is pretty thin stuff. You generate workers, buy buildings, place them on the buildings, and collect points. I enjoyed it for what it is, but other games of this ilk, such as Orleans, appeal to me more. The Grizzled. This tough co-op title follows a squad of French soldiers through the horrors of World War I. They will only survive by sacrificing for each other. It’s a though-provoking spin on the co-op genre. The weekend proved both exhausting and exhilarating. 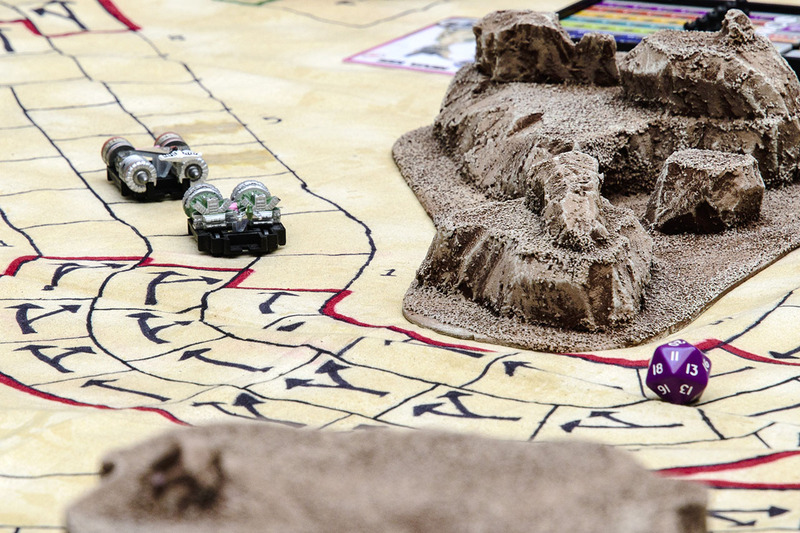 These days, I find the explosion in board game design much more interesting than what’s going on in video games, even though I love me a good video game. 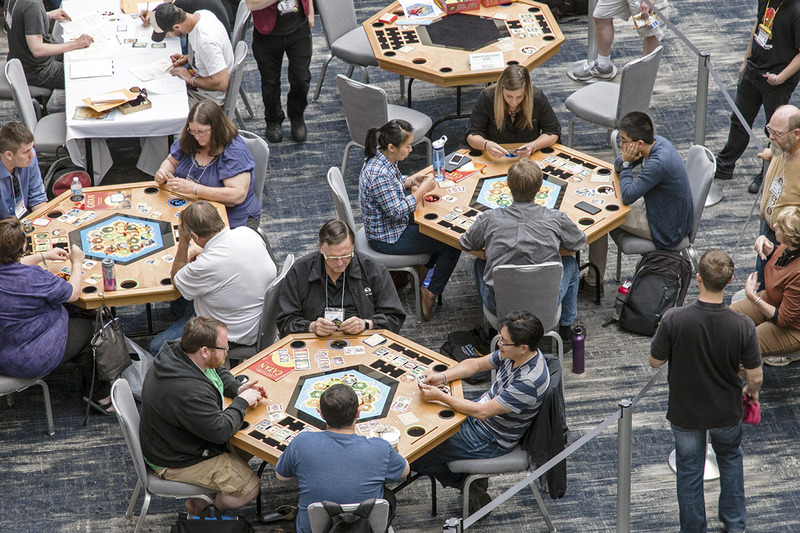 Maybe it’s the social element, maybe it’s the acceleration in game design innovation, but board games seem to be driving much of what goes on in modern ludology these days. By the way, there’s this hot new game, Rebellion. Could I interest you in a game? My understanding was that attendance wise this was the biggest Kubla ever. I think that they said that was around 3100 people there this year. I am glad that you also mentioned Colony I looked at it a couple of times and was bummed that I didn’t get a chance to try a demo of it. We’re big fans of Suburbia, Alien Frontiers and deck builders so this looks like it could be a slam dunk for my wife and I. Did you get a chance to try it out? I did get a chance to play a demo game. It takes some of the dice-rolling combo mechanics from Favor of the Pharaoh and builds them on top of a deck building game. It less dry than FotP, but like many of Alspach’s meatier games, also includes many opportunities for analysis paralysis. I much enjoyed it, and will likely pick up a copy on release. 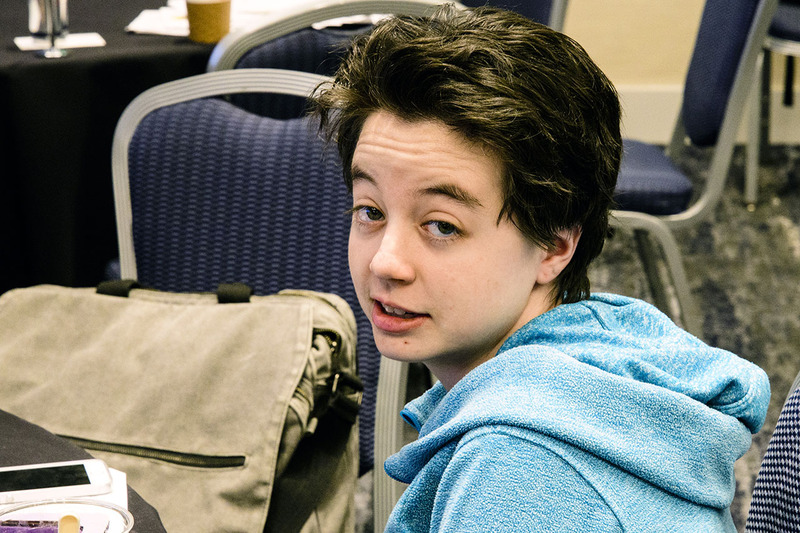 Loved your photo Essay and how you captured the positive aspects of the convention. 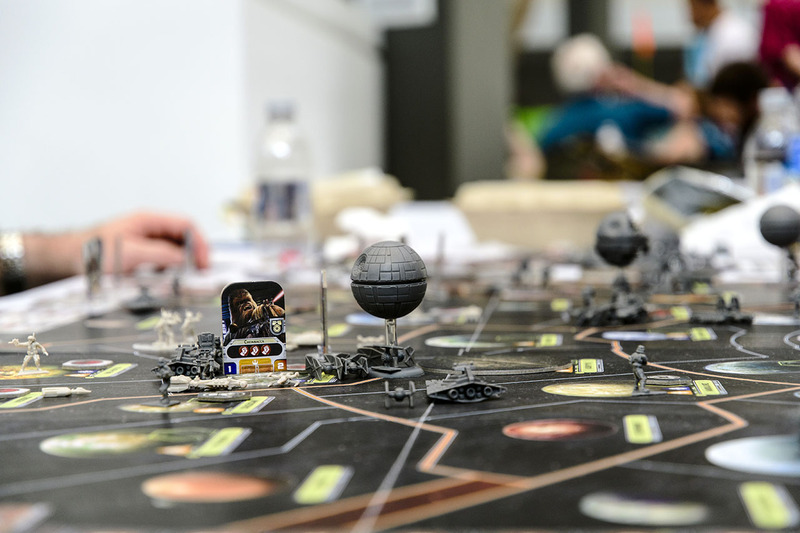 I also really liked your pictures of my X-wing Event. Thanks! I carried new camera while shooting those photos, and was pretty pleased with the result. 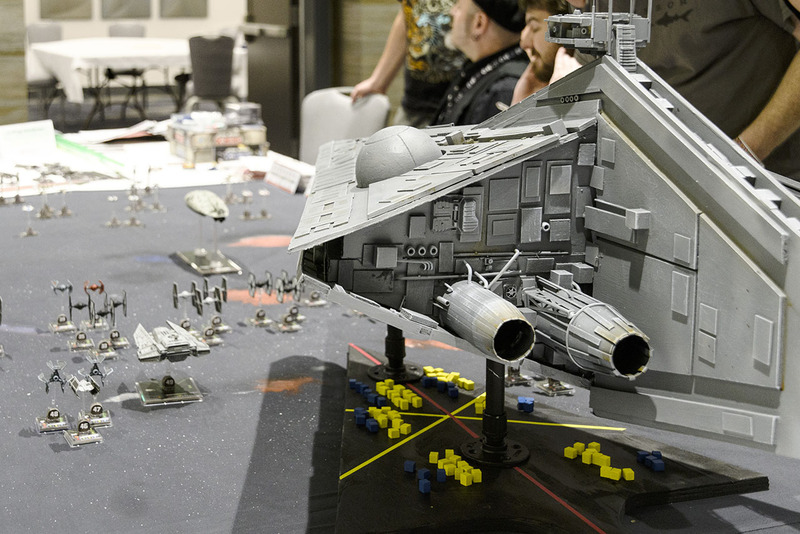 Your X-Wing Miniatures event looked pretty awesome. The pictures didn’t really capture the scale.